Alberta's no hassle, no nonsense dealer since 1952! You love going on adventures, especially in Northern Alberta where there are so many places to explore and so much to experience. But this is not a place for cars, is it? No. This is a landscape born to reward those who have the versatility and the capabilities to weather the seasons and the obstacles that present themselves along the way. You need an SUV. And if you've got your eye on the Jeep Cherokee - you're already on the right path - because this is the compact SUV that's equipped for adventure. 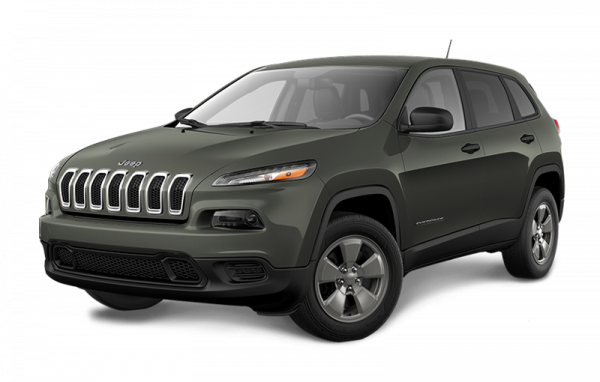 Find the model that best reflects your needs and your driving dreams with a Jeep Cherokee for sale near Edmonton and join us at Leduc Chrysler, your no hassle, no nonsense dealer! At Leduc Chrysler, we believe in extending the same quality of service to our customers that we'd expect to offer our friends and family. We've been serving Leduc and surrounding communities with quality vehicles and amazing services for over 60 years and are fully committed to providing the same level of success and the same incredible opportunities for at least another 60! When you're looking for a quality Chrysler, Dodge, Jeep, or Ram vehicle come visit us at 6102 46A Street in Leduc, AB, or call us at 780-986-2051. We're going to ensure you have a quality experience worth telling people about! Never a hassle, never any sales pressure since 1952. We're involved with local charities to help strengthen our community. That's right! Buy from us and we'll deliver your vehicle to right to your door, anywhere in Alberta! The Jeep Cherokee is not only ready for adventure, but spacious enough that you will be too-no matter what you need to take along. The Jeep Cargo Management System includes useful hooks, a removeable grocery bag holder, and up to 17 cubbies, pockets and bins. There's space for everything with amazing versatility from the rear 60/40 split-reclining rear seats and the front passenger seat can also fold flat for longer items you need to transport. When your next adventure is calling, the Jeep Cherokee will answer. Save time with adjustments when you share your vehicle with someone else. The Jeep Cherokee can save three driver seating positions, outside mirror preferences, and even radio station presets so you don't have to waste time fiddling with seat adjustments when you need to be on your way. For even more convenience, the available ParkView Rear Back-Up Camera gives you a great view of what's behind you as soon as you shift into Reverse, making backing up and parking a breeze. Go anywhere easily and get great fuel efficiency with the 2.4L Tigershark MultiAir I-4 engine, featuring 184 horsepower and 171 lb-ft of torque. For even more power, choose the 3.2L Pentastar VVT V6 with 271 horsepower and 239 lb-ft of torque. The Pentastar engine also features Stop/Start technology and a Segment-First 9-speed automatic transmission to help improve emissions and fuel consumption. You'll be able to get where you're going with less stops at the gas pumps, making an already enjoyable journey that much better. You'll want to keep your new Jeep Cherokee performing at its best for many enjoyable years on and off the road, so be sure to take it in for regular maintenance at our service department. Our expert technicians know your Cherokee inside and out and will ensure it's always running in top condition and able to take you away on your next adventure. We service your vehicle using genuine OEM parts for the perfect fit and that factory fresh feeling every time. Feel free to take advantage of our loaner cars or shuttle service when your vehicle is in our shop. We'll have your vehicle fixed right and back to you in no time at all, at Leduc Chrysler. Leduc Chrysler offers fantastic products and valuable services for great prices, however, what truly makes us stand apart from the competition is our customer service. Since we opened our doors in 1952, we have dedicated ourselves to making buying a vehicle with us an enjoyable experience. We want to help you find the next new or used car of your dreams, and we want you to have a delightful experience every time you visit us. We do this by treating our customers like friends, and this in turn creates lasting relationships built on trust. We care about our community as a whole, and that's why we are regularly involved in charities and community events. Join our family at Leduc Chrysler, and experience the difference when you have a dealership whose staff truly cares about providing the best experience possible, while offering you premium products and services. You can find us at 6102 46A Street in Leduc, AB, or call us at 780-986-2051. Our experience with Leduc Chrysler was very good. Everyone was friendly and accommodating. We bought a great product and had a positive buying experience. Will definitely recommend this dealership to family and friends. Went there looking for a specific used SUV. Had an incredibly professional, respectful, and pleasant salesman walk is through the process. The sales manager came to see us to make sure that we were happy with everything, comfortable with the deal, and aware of all options. Everyone has been an absolute pleasure to deal with. Highly recommend. This was the most positive experience I have ever had purchasing my new vehicle. The staff were very helpful and amazing. Thank you so much Brad, Dave, and Christina-you are awesome. I would recommend this dealership to everyone buying new or used.